The Trials of Virtuous Succession have ended. Prince Andreus is king—and Princess Carys is dead. But even as he’s haunted by what he did to win the throne, Andreus discovers that his dream of ruling only brings new problems. The people love his twin even more in death than they did when she was alive. The Elders treat him as a figurehead. And worst of all, the winds of Eden are faltering. But despite what everyone believes, Carys is alive. 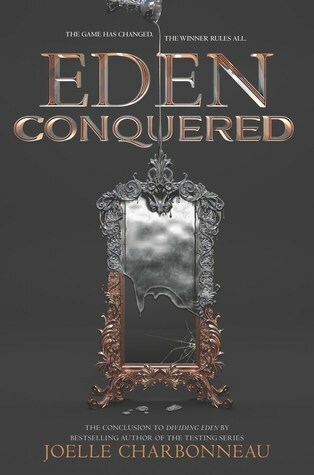 Exiled to the wilderness, Carys struggles to control the powers that have broken free inside her. And as she grows stronger, so does her conviction that she must return to the Palace of Winds, face her twin and root out the treachery that began long before the first Trials started. The Kingdom of Eden is growing darker with each passing day. Brother and sister, former foes, must decide whether some betrayals cut too deep to be forgiven—and whether one will wear the crown or both will lose everything. There are some series where when you haven't read or even thought about them, you may have to go back and refresh your memory. Refresh yourself with the characters, the events that have taken place or even the entire story but the world that Charbonneau perfectly crafted, this was all but the least of my worries. I turned to page one and everything came back into me. starting back with a kingdom torn. Carys faking her own death making Andreus king. However, both twins have their own dangers they must face both in and out of the castle. Will fate bring them back together to face the evils that are lurking in the dark. I know I said this with the first one but to me this story is a full on Game of Thrones for teens. Even though there is no dragons there is so much that I felt myself going back and forth between these two stories. Now I may be the only one who saw this but I am perfectly fine having my own imaginations. Carys and Andreus really grew from the first novel to the end of this one. Even though there were moments of doubt I had with Andreus, he came through in the end. These two characters go through so much on their own that they fail to realize that their true strength lies in working together. Joelle Charbonneau writes a stellar conclusion to this fantastical series. With a story that will take you on an adventure full of action, adventure, and the emotions that makes a story rememberable, this is a one story you do not want to miss.